The other night I was playing Cards Against Humanity with a couple friends. If you want to laugh harder than you’ve ever laughed before, this is the game for you. Though it may be extremely politically incorrect and a bit raunchy, it is by the far one of the most hilarious party games ever. My cheeks are still sore from all the smiling and laughter. 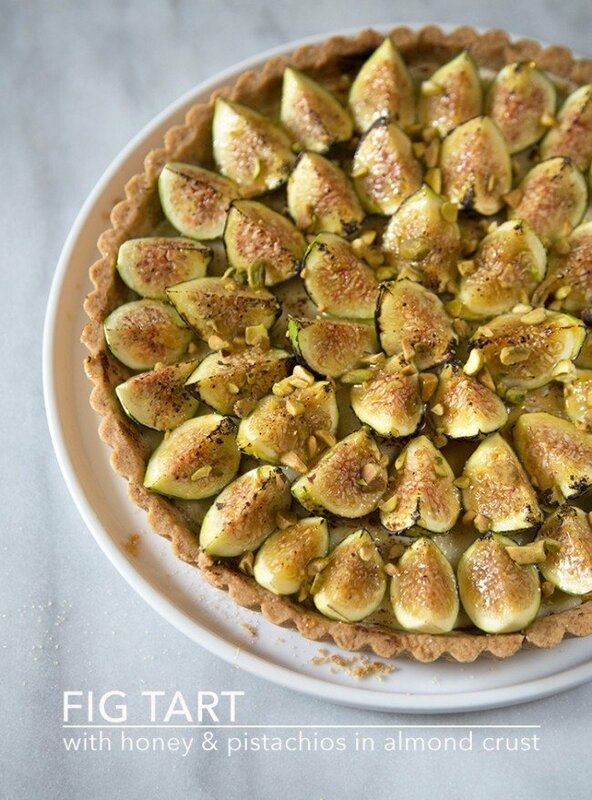 For game night, I made this fig tart with honey and pistachios. It’s a sweet and classy tart. My inspiration came from cheese boards. Cheese boards usually consist of dried fruits (maybe dried figs, dried apricots), honey and nuts. This tart is fabulous with some wine, and even greater when served along side a charcuterie board. This was my first trying green figs. I’m used to eating black Mission figs (mainly because that is what is grown in California). These green figs are surprisingly sweet and sort of reminds me of prunes, but in a good way. There are nearly hundreds of different fig varieties. Each different in flavor, skin color and size. 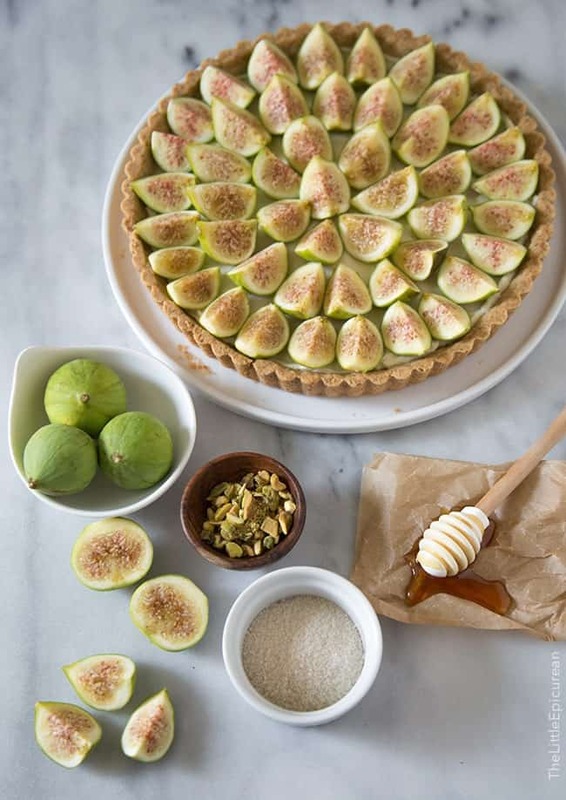 Depending on the kind of figs you find, your tart may taste slightly different. I bought my figs at Trader Joe’s. I believe they are Kadota figs. They have a light green color and are a little bit more round than other figs. It sort of resembles a guava on the inside, due to its light pink interior. The crust is very tender and very easy to eat with a fork. I love tarts but for the most part, tarts are often really difficult to eat. The crust is usually hard and crunchy, and immediately shatters into pieces when pierced with a fork. The crust for this fig tart is nothing like that. It’s crumbly and holds well together. 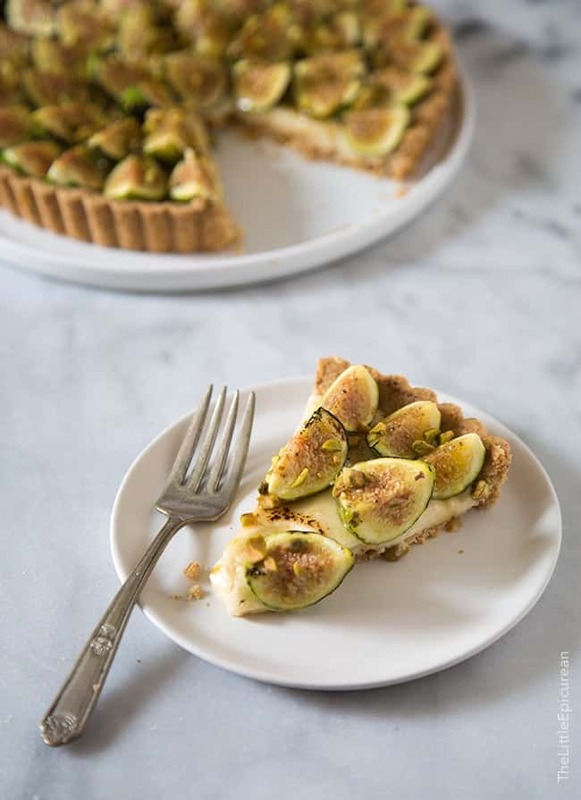 The crumbly crust is then filled with a sweet and smooth honey sweetened cream cheese- which is absolutely perfect with the fresh figs. I sliced the figs into quarters and arranged them face up on the cream cheese. If you have smaller figs, you can just slice them in half. Fresh figs are great, but adding a sprinkling of sugar and using a kitchen torch to brûlée the figs is just purely divine. As if brûlée-ing the figs were enough, I went a step further and splashed the figs with a little bit of honey. And to satisfy my need for crunch in desserts, I sprinkled some crushed pistachios all over the fig tart. My friends loved the tart! (And Alex devoured everything that was left over.) 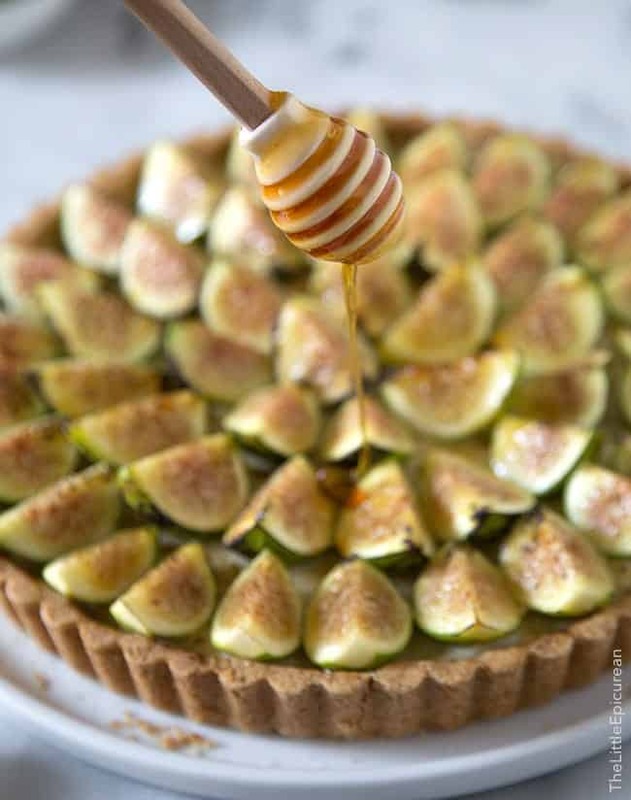 This fig tart is definitely going to be a repeat dessert that I’ll be asked to make over and over again this summer. This sweet and sophisticated tart was inspired by cheese boards. Cheese boards usually include dried fruits, honey and nuts. This tart is fabulous with some wine, even greater when served with a charcuterie board. In a food process, combine flour, almond flour, salt, and sugar. Pulse to mix. Add cold butter. Pulse 4 times at 3 second intervals to lightly mix together the ingredients. Add egg yolk and pulse until dough begins to come together. Dump the dough onto a clean working surface. Gather the dough together and push into a ball. Flatten dough to about 1-inch thickness. Wrap dough in plastic wrap and let chill in the fridge for 30 minutes, or until well chilled. Preheat oven to 350 degrees F. Roll dough out on a lightly floured work surface. Press dough onto the bottom and up the sides of a 9-inch fluted tart pan with a removable bottom. Bake for 25-30 minutes until golden brown. Let cool on wire rack to room temperature before filling with cream cheese. Using a hand mixer or a stand mixer, beat cream cheese until smooth. Add sugar and honey. Mix until combined. Spread cream cheese filling into cooled tart shell. Arrange cut figs on top of cream cheese filling. Cover with plastic wrap and keep chilled in the fridge until ready to serve. Right before serving, sprinkle granulated sugar (as needed) over figs. Use a kitchen torch to brûlée the figs, creating a nice golden sugar crust. 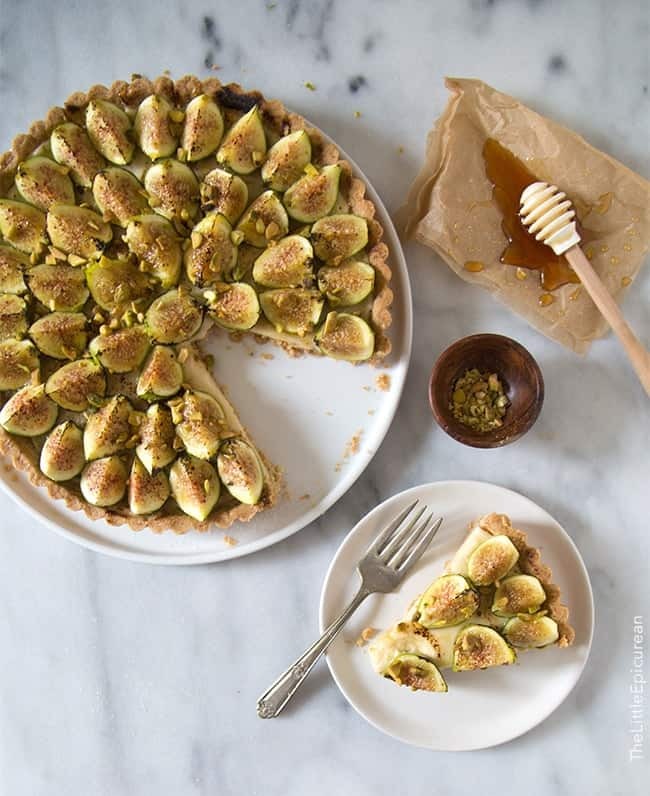 Drizzle honey and crushed pistachios over tart. Serve immediately. This looks awesome! Love all the flavours and figs are one of my favourite fruits! Thank you Millie! Fresh figs are so good but when you drizzle a little honey and add a little pistachio crunch, it’s so wonderful! this is too pretty for words! my boyfriend LOVES figs – definitely pinning this one for inspiration!